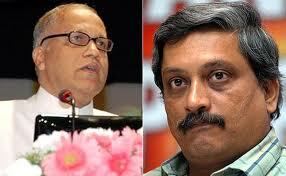 Goa News |Will it be Parrikar-led BJP Govt or Cong-led (by whom)? In spite of getting less number of seats, the Bharatiya Janata Party is desperately trying to form the government with defence minister Manohar Parrikar throwing his hat in the ring. On the other hand, Congress is trying its level best to choose the leader who is acceptable to all the to-be-alliance-partners; mainly Goa Forward. The BJP is presently on a sticky wicket as Goa Forward has made it clear it would support any government of secular forces who would protect Goenkarponn. The 13 BJP legislators, who met in the town today morning, have passed an unanimous resolution urging party’s national president Amit Shah that Parrikar be sent back to Goa, to take over as the CM. If required, they have also decided to fly to Delhi to press for their demand. Parrikar, who did not speak to the media, also attended the meeting. The BJP can form the government only if the Maharashtrawadi Gomantak Party as well as Goa Forward supports them, besides the independents. The 13-member BJP can reach the magic figure of 21 only if both the MGP and GF (3 members each) support to make it 19. The rest 2 could be chosen from among 3 independents or sole NCP MLA-elect Churchill Alemao. The MGP leaders, including Sudin Dhawalikar, have already announced that they are prepared to support the BJP-led government, provided Parrikar is the CM. Independent MLA Govind Gaude has also said that BJP-led government would be his first preference, but Congress is not an untouchable to him. To convince Goa Forward, it is learnt that 7 Christian MLAs-elect of the BJP have come forward to make an appeal to Goa Forward to keep the BJP-led government secular. Congress however has more options, theoretically, to choose from among the rest 10. It can form the government even with three independents and Churchill. But, practically, it has no option than embracing both the MGP and Goa Forward, failing which they would go to the BJP. GPCC chief Luizinho Faleiro, elected from Navelim, is the obvious choice since he rode the party to victory and has also 7 among the 17 MLAs on his side. But Goa Forward has firmly decided not to support the Congress government led by Faleiro because of the games he played to keep GF away from the alliance and fielding candidate against their three candidates – Vijai Sardesai, Jayesh Salgaonkar and Vincent Rodrigues. Digambar Kamat has thus garnered support of quite a few Congress MLAs, including Babush Monseratte-supported three legislators – Jennifer Monseratte, Francis Silveira and Tony Fernandes. Sources say he is also enjoying support of two independents – Rohan Khaunte and Prasad Gaonkar – besides his natural ally – Goa Forward. But high command observers Digvijay Singh, K Venugopal and Chellakumar have decided to meet all the MLAs-elect individually in order to arrive at a conclusion over the leadership issue. The Congress may finalise the leader by today evening.